"We grow old because we stop playing." Tag, the preposterously premised story very much inspired by a true story and accompanying Wall Street Journal article about the eponymous decades-long childhood game carried well into adulthood, is a supremely dumb and pretty fun broad, slapstick physical comedy. Director Jeff Tomsic's hyperactive film is basically Home Alone for adults with a touch of Game Night (also a New Line Cinema film) with its high concept hijinx centred on middle-aged male friendship. 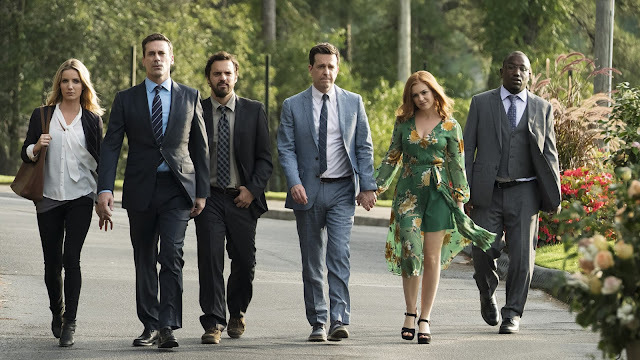 Somehow, Ed Helms, Jon Hamm, Jake Johnson, Hannibal Buress, and Jeremy Renner all play classmates despite clearly spanning over a decade in age, but they're interplay and reverence for each other make it work well enough. They don't have much in common and the game lets them share their lives together albeit it truly antagonist ways. Helms is the real driving force as the ringleader with a master plan to "tag" Renner at his upcoming wedding and end his undefeated streak of never being "it" after thirty years escaping the month of May without ever being tagged. Hamm, breezy as ever, plays the straightman full of confidence, Johnson the unemployed stoner loser, Buress the aloof but witty everyman, and Renner the villain. Renner clearly had a good time getting to good around outside his usually serious action oriented roles. While there's a lot of obvious male energy, the filmmakers widely populate the silly fun with plenty of notable female roles to check and encourage their behaviour. However, Annabelle Wallis inexplicably and unnecessarily tags along as a WSJ journalist tying the film and its loose real-life inspiration together for no reason. A scene-stealing Isla Fisher as Helms' very intensely encouraging wife is essential to the escalating ridiculous. Rashida Jones as a grade school ex of both Hamm and Johnson invited by Renner to complicate matters in a less than subplot but her incredible presence is never unappreciated. In a small but energetic role, Leslie Bibb as Renner's very excited fiancée further lights the fire of the boys' antics. Rob McKittrick and Mark Steilen's script slims down the real-life team of ten classmates wisely to five yet the extra four female sidekicks overpopulate the laser-focused, tight hundred-minute comedy. Wallis, Fisher, Bibb, and Jones all weave in and out of the antic sometimes without explanation showing up without consistency when the story dictates their need to show up. A stellar soundtrack of era-specific hip-hop tunes to keep the air of nostalgia, recapturing youth, and silly camaraderie throughout. The use of tag the game to shrink the growing gap between the adult friends while keeping Renner's character detached is heavy-handed and clunky but effective nonetheless. Tag is mostly undeniably well-choreographed fun ride but its self-acknowledge sentimental heart about friendship often weighs down the physical fun and action humour. However, It never really escapes its childhood at heart nature injected with plenty of adult jokes. Its commitment to the wacky premise and ridiculous action make the chaos all the more entertaining. There's just enough substance to life the film beyond its hokey but heartwarming idea of arrested adolescence.